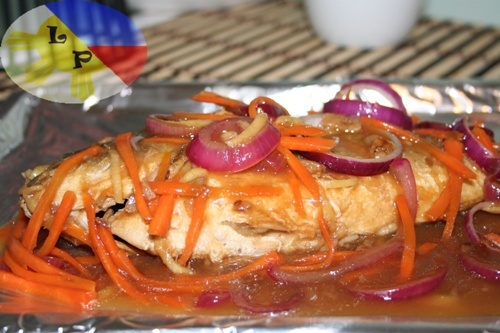 Escabeche is a sweet and sour fish Filipino style. Combination of vinegar and sugar and blended with the test of ginger that make escabeche one of the Filipinos favourite food. Try my escabeche recipes. Rub fish all over with salt. Then fry in a hot oil until become brown. And place the fish on a serving dish and set aside. In different frying pan put 3 tsp. oil, saute garlic, onion and ginger, then add carrots and saute for another 1 minute. Then add dissolved cornstarch, cook until slightly thick. Pour sauce over the fish and serve with boiled rice . this is perfect for the lenten season.. for those who are to lazy to make the sweet and sour sauce.. i just usually buy a bottle of premade and take it from there.. put a bit more vinegar and sugar..
Hey Buddy!, I found this information for you: "Escabeche recipe". Here is the website link: http://lutongpangpamilya.com/escabeche/. Thank you.